In recent years, Singapore has established a more robust system of maternity and paternity leave to support young parents in the workforce. This came in the form of longer paternity leave and the introduction of shared parental leave for working fathers, as the Government explores new ways to encourage young couples to have babies. Singapore saw nearly 34,000 citizen babies in 2015, the highest in over a decade, so this increase in benefits is very timely. It is important for potential and new parents to know their rights, and for employers to take this into account and plan for these changes that affect parents in their employment. 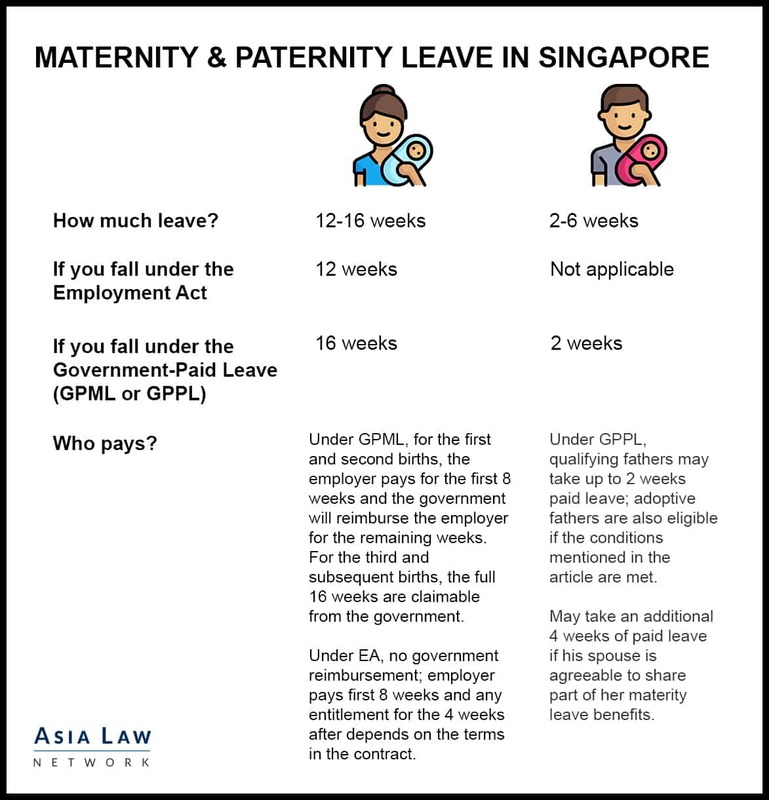 Mothers are entitled to 12-16 weeks of maternity leave, depending if they fall under the Employment Act (“EA”) or the Government-Paid Maternity Leave (“GPML”) scheme under the Child Development Co-Savings Act. For those covered by the GPML scheme, the amount of maternity leave does not increase for subsequent childbirths but the government will reimburse the employer for the entire 16 weeks (and not just the last 8 weeks) if it is a third or subsequent birth. Qualifying fathers (who meet the criteria listed below) are entitled to just 2 weeks of paternity leave under the Government-Paid Paternity Leave (“GPPL”) scheme. Qualifying fathers are entitled to up to 6 weeks of parental leave in their baby’s first year when they include shared parental leave. As an employer, the rights with respect to an employee’s maternity and paternity is of vital concern, as knowledge of such rights allows early management planning to address manpower concerns as a result of the absence of such employees during leave periods. Female employees should be warned that they must inform their employers of their delivery as soon as possible, and give them at least 1 week of notice before going on maternity leave. If not, one is only entitled to half the salary payment during maternity leave, unless there is a good enough reason for not giving the notice. Child is a Singaporean citizen. Mother has worked for her employer or has been self-employed for at least 3 continuous months before the birth of the child. If one is self-employed, she must have lost income during the maternity leave period – her net trade income, over the 12 months preceding the birth of her child, can be used for Government-Paid Maternity Benefit computations. If the working mother qualifies for the GPML scheme, she is entitled to her usual monthly salary during the leave period. Employers may then claim reimbursement from the Government. The amount of reimbursement will ultimately depend on the number of children the employee currently has. The reimbursement is capped at $10,000 per 4 weeks. First & second The first 8 weeks are paid by the employer. Employer may claim reimbursement for salary payments for the last 8 weeks of maternity leave. Third & subsequent The full 16 weeks are claimable from the Government. For female employees that do not qualify for the GPML scheme, she may be entitled to 12 weeks if she is covered by the EA, and fulfills the necessary criteria. Generally, any person who is employed in a managerial or an executive position and is in receipt of a salary not exceeding $4,500 a month (excluding overtime payments, bonus payments, annual wage supplements, productivity incentive payments and any allowance however described) will be considered an employee for the purposes of the EA. Unlike the GPML scheme, the government does not reimburse the employer for salaries paid under maternity leave covered by the EA. The employer is required to pay monthly salary for the first 8 weeks of maternity leave. Whether the employer is required to pay salary during the last 4 weeks of maternity leave depends ultimately on the terms of the employment contract between the employer and employee. A female employee’s maternity leave entitlements may vary under different situations. Child is not a Singaporean citizen Employee does not qualify for the GPML scheme. Employee may only be entitled to 12 weeks, if criteria (2) above is met and employee is covered by the EA. Foreigners or PRs working in Singapore The eligibility criteria listed above applies to all workers, regardless of nationality, as long as the requisite criteria is met for either scheme. Single/unmarried mothers Single mothers qualify for the GPML scheme if criteria (1) & (2) are met. Contract/temporary/part-time employee The employee may qualify for either scheme as long as the requisite criteria is met. Employee will be paid at the gross rate for each day that she would normally have been required to work under her contract. Employee that is on probation The employee may qualify for either scheme as long as the requisite criteria is met. Birth of twins Birth of twins or triplets will be treated as a single delivery. As such, an employee will not receive double maternity benefits. However, there has been a motion in parliament about two months ago requesting for parental leave to be extended for fathers and mothers with multiple or premature babies. Premature birth The employee may qualify for either scheme as long as the requisite criteria is met. The maternity leave will start from the child’s birth date. Abortion or miscarriage The employee is not eligible for maternity leave, but may take paid sick leave if applicable. Mother is ineligible for GPML (i.e. does not fulfil criteria (1) & (2) above) at the time of delivery If the mother becomes eligible for GPML within 12 months of the child’s birth, she is eligible for the remaining maternity leave entitlement (out of 16 weeks) untaken. The remaining maternity leave must be taken before the child turns 12 months old. Father is or has been lawfully married to the child’s mother between conception and birth whether or not such marriage remains subsisting at the time of the birth of the child or becomes lawfully married to the child’s mother within 12 months from the child’s birth. Father has worked for his employer or have been self-employed for at least 3 continuous months before the birth of the child. If one is self-employed, he must have lost income during the maternity leave period. Note: An adoptive father is eligible for paternity leave if he meets the eligibility criteria – adoptive father or his wife is a citizen of Singapore on the date the dependant’s pass is issued in respect of the child and he has worked for his employer or is self-employed for a period of at least 3 months before the eligibility date for the application to adopt the child. The current two-week entitlement is a new rule that came into effect recently. Prior to this, only one week of paternity leave was compulsory while companies could offer one additional week on a voluntary basis. With the new changes, the government will pay for the additional week of leave. A father’s GPPL entitlement per week depends on the number of working days he has in a week. Similar to GPML, the employer may seek reimbursement from the government. Each week of GPPL is capped at $2,500, including CPF contributions. Shared parental leave provides the option for working fathers to receive part of their wife’s leave benefits. In other words, mothers will be able to share up to 4 weeks of their paid maternity leave with their husbands (up from just one week prior to recent changes). The child’s mother qualifies for GPML. Father is lawfully married to the child’s mother. The government will fund the shared parental leave taken, capped at $2,500 per week including CPF contributions. Question 1: Am I entitled to keep my job after I return from maternity? It is an offence for your employer to dismiss you while you are on maternity leave. However, your employer may terminate you before you go on maternity leave but if you feel you have been unfairly dismissed or there was a dispute with your employer over maternity leave, you may file a dispute with the Ministry of Manpower. In any case, your employer is required to pay you maternity benefits if you have worked for your employer for at least 3 months before giving birth. Question 2: Do I get paternity leave if I am not married to my child’s mother? No, you have to be married to the child’s mother after the child is conceived but before the child’s birth or at least within 12 months from the child’s birth. Question 3: Can I use my maternity leave to offset my notice period? No, your maternity leave cannot be used to offset against notice period. Have a question on parental leave? If you have any questions about parental leave, you can get a Quick Consult with Lau Kah Mei for a transparent, flat fee of S$49. You can expect a call back within 1-2 days on the phone to get legal advice and have your questions answered. This article is written by Lau Kah Mei and edited by Ng Shu Yih from Asia Law Network.